The Rock Is Pounded. Head coach Mike Riley knows that Nebraska’s output from the running backs on Saturday wasn’t good enough. According to Sam McKewon of the Omaha World-Herald, the coaches are considering leaning more on one back as opposed to the rotation we saw on Saturday. One game is a small sample size, but based on that evidence Mikale Wilbon should be the guy that gets the bulk of those carries. His elusiveness – particularly combined with an offensive line that has been struggling to create running lanes – seems to be the skill set that fits Nebraska’s needs best right now. Regardless, Nebraska’s offense was out of balance against BYU, gaining 319 yards through the air and 126 on the ground. Even accounting for BYU’s weakness in pass defense and that some of Nebraska’s pass yardage was on screens and other run-substitute plays, more from the ground game would help immensely. Freedom Rings. One of the glaring deficiencies from Nebraska’s game against BYU was a lack of pressure from the defensive end. Nebraska did better in heating up BYU’s quarterbacks in the second half, in part from bringing blitzes and in part from the interior defensive line finding success against a tiring BYU offensive line. But if Nebraska is going to be successful, particularly asking its corners to cover one-on-one for extended periods, then the defensive ends have to get home. And that’s where the ascension of Freedom Akinmoladun becomes important. An injury to Jack Gangwish has given Akinmoladun his chance to start and play extended time. Gangwish beat out Akinmoladun for the position this fall, and as a team captain it is a loss for him to be off the field. But Akinmoladun, a converted tight end just learning the position, has the raw athletic potential to be the difference-making edge rusher unlike anyone else currently on Nebraska’s roster. Throwing him into the fire gives that athletic ability a chance to be on the field at a position of critical need. Nebraska Converts. Yeah, the last play hurt. But in the three drives before that play, Nebraska had a third-and-one, a third-and-one, and a third-and-three. On each of those, Nebraska couldn’t get the first down, continuing to give BYU a chance to recover. It doesn’t matter if it’s lining up and pushing ahead for a yard, or hitting a play-action pass, or any other method. If Nebraska makes one of those third-down conversions, BYU likely never has a chance to hit that last pass. Against South Alabama, look at those third-and-short situations and see how Nebraska responds. Nebraska Needs Its Kickers. I am amazed at how little this aspect of Nebraska’s roster is being discussed in the wake of the BYU loss. At punter, Nebraska is down to its scout team quarterback pressed into punting duties, Tyson Broekemeier. He performed admirably against BYU, but he becomes a net liability for Nebraska going forward. And Nebraska’s placekicking game is a source of tremendous concern. Drew Brown missed field goals of 40 and 41 yards against BYU, and the lack of those six points gave BYU the chance to win on that last play. Sure, it’s one game, but it’s not like Brown impressed last year. Brown was 14-of-21 on field goal attempts, with a long of 44 yards. From forty yards and out, Brown now has a 2-for-9 (!) record. Forty yards isn’t, for a college-level kicker, a long way to kick a football. And unless we see a dramatic improvement in a real hurry, it’s hard to have any confidence in Nebraska’s ability to put three on the board when the need arises. The Corners Crumble. Nebraska’s defensive structure (particularly with Michael Rose-Ivey returning from suspension) allows the defense to put eight players in the box to stop the run. But it asks the defensive backs, particularly the corners, to play one-on-one coverage and consistently win those battles against opposing receivers. In the second quarter, as BYU quarterback Taysom Hill carved up the Blackshirts secondary en route to a 17-point performance, it looked as if those corners were struggling. South Alabama runs an up-tempo offense and can score on big plays, as it did last week against Gardner-Webb with scores of 49, 56, and 92 yards. The Jaguars have real speed on their roster in players like Xavier Johnson and Terrence Timmons, who will make the Blackshirts pay for any mistakes on the edges. Don’t be surprised if South Alabama hits a few home runs against Nebraska on Saturday. Just hope it’s not too many. The Second Quarter Was Real. Boy, that first quarter felt good, didn’t it? Nebraska quarterback Tommy Armstrong looked in rhythm, the offense was clicking, and the start of the Riley era was a joy to behold. Then the teams flipped ends of the field, and we saw the Armstrong we saw last year. Flustered, poor mechanics, running for his life and overthrowing open receivers. 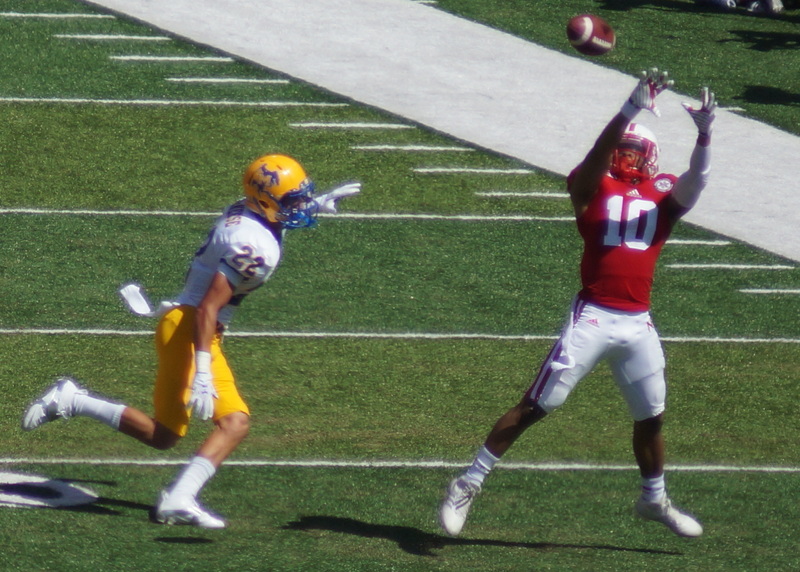 After starting the game going 10-for-12 throwing the ball, Armstrong was only 4-15 in the second quarter. Which Armstrong will we see on Saturday? The more of second-quarter Armstrong shows up, the more likely it will be that Nebraska will struggle. South Alabama has enough talent to do damage, but a mature coaching staff should have the team’s full attention after a heartbreaking loss. Look for Nebraska to win a game that will likely be more comfortable than the score indicates.